Clean Water America - Water Softeners, Water Filters, Whole House and Undersink Reverse Osmosis Systems | SW FL - Fort Myers, Naples, Lehigh Acres, Cape Coral, Port Charlotte. 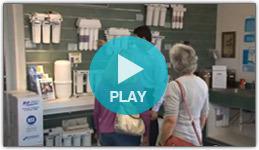 WATER FILTERS, REVERSE OSMOSIS SYSTEMS, WATER SOFTENERS, SERVICE AND REPAIRS. WELCOME to Clean Water America! an unpleasant taste due to chemicals or organic contaminants? If your answer is YES ….. CALL 239-204-3206! silky texture of your hair or the smoothness of your skin? Does your present water treatment equipment work perfectly all the time? Do you have a water consulting expert that you rely on and fully trust? If your answer is NO……CALL 239-204-3206! We can test your water in your home or in our stores. Over the past 24 years we have successfully helped over 37,000 customers.